On September 7, 2018, we had a question-and-answer call with Dolly Chugh, PhD, an award-winning, tenured professor at the New York University Stern School of Business. She studies implicit bias and unintentional unethical behavior and is author of the new book, The Person You Mean to Be: How Good People Fight Bias. 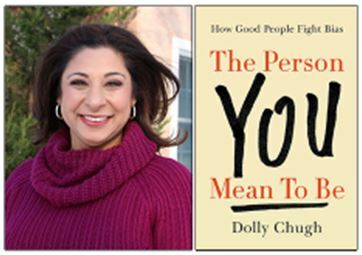 About The Person You Mean to Be: How Good People Fight Bias—by Dolly Chugh, PhD. This is an inspiring guide from Dolly Chugh, an award-winning social psychologist at the New York University Stern School of Business, on how to confront difficult issues including sexism, racism, inequality, and injustice so that you can make the world (and yourself) better. She argues that the only way to be on the right side of history is to be a good-ish— rather than good—person. Good-ish people are always growing. Second, she helps you find your “ordinary privilege”—the part of your everyday identity you take for granted, such as race for a white person, sexual orientation for a straight person, gender for a man, or education for a college graduate. This part of your identity may bring blind spots, but it is your best tool for influencing change. Third, Dolly introduces the psychological reasons that make it hard for us to see the bias in and around us. She leads you from willful ignorance to willful awareness. Finally, she guides you on how, when, and whom, to engage (and not engage) in your workplaces, homes, and communities. Her science-based approach is a method any of us can put to use in all parts of our life. A businessperson turned academic, Dolly Chugh, PhD, is a tenured professor at the New York University Stern School of Business where she teaches courses in leadership, management and negotiations in Stern’s full-time MBA program and the NYU Prison Education Program. Dolly’s research focuses on the psychological constraints on the quality of decision-making with ethical import, a phenomenon known as “bounded ethicality” (Chugh, Banaji, and Bazerman, 2005). She is particularly interested in unintentional forms of unethical behavior. 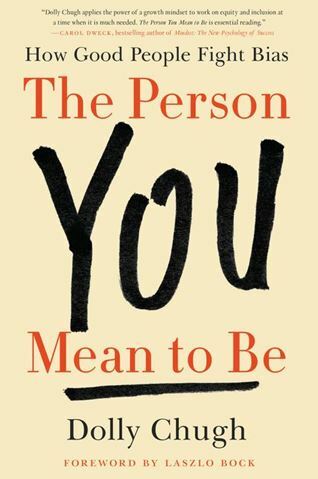 This week she has published a book titled The Person You Mean to Be, for individuals and businesses wanting to overcome unconscious bias to build a better workplace and world. In addition, Dolly has written on these topics in Psychological Science, Harvard Business Review, Social Justice Research, The American Economic Review, and The Journal of Behavioral Decision Making. Media coverage of her research includes Forbes, the Washington Post, CosmoGirl, The New York Times, the Economist, Huffington Post, the Financial Times, and the Stanford Social Innovation Review. Dolly is a passionate advocate for and participant in the education reform movement. Her primary contribution to this work lies in the leadership development of the educators playing critical leadership roles in the KIPP charter school network, ranging from grade level chairs and curriculum chairs to deans, principals, and regional leaders (akin to superintendents) to foundation level managers. Through this work on the faculty of the KIPP School Leadership Program, Dolly has had the privilege of facilitating the leadership development of over 500 school leaders since 2008. Prior to her decision to pursue an academic career of teaching and research, Professor Chugh worked in both professional services and line manager roles at Morgan Stanley, Sibson & Company, Time Inc., Scholastic Inc., and Merrill Lynch. Professor Chugh received a B.A. from Cornell University where she earned a double major in Psychology and Economics and served as a two-time co-captain of the Varsity Tennis Team (1990), an M.B.A. from the Harvard Business School (1994), and a PhD in Organizational Behavior / Social Psychology from Harvard University (2006). Chugh, et al (2014) Professors are prejudiced,too. The NYT Sunday Review. Bazerman, Chugh (2006). Decisions without blinders. Harvard Business Review. Banaji, Bazserman, Chugh (2003). How (Un)Ethical Are You? Harvard Business Review.